Piano Trio No.5 In D, Op.70 No.1 - "Geistertrio"
Ravel's "Mother Goose" is wreathed] in innocent wonder. Superb live performances from classical music's A-listers . . . The album opener, Beethoven's "Ghost' Trio" features Rachlin and Maisky and is brilliantly performed with all the various shifts in mood from vital to mysterious expertly negotiated as required. Argerich's duet with Lang Lang on Ravel's "Mother Goose" is a stand-out moment, as is the album's ending with Gabriela Montero improvising on "Happy Birthday" -- what more could you ask for?
. . . outstanding . 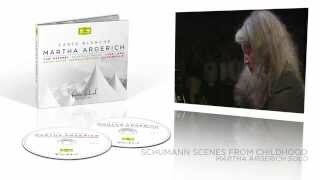 . . [Schumann / "Kinderszenen"]: A delight from beginning to end, Argerich finds poetry in every episode. The piece that impressed me most on this CD was Schubert's "Arpeggione" Sonata. Most often played by cellists, here the solo part is in the hands of violist Yuri Bashmet. After hearing this performance, I am convinced that the viola is the ideal instrument for this music, but more importantly, Bashmet and Argerich work wonders with tempo and dynamics. This piece can be tediously repetitious and predictable, but not here, where the performers' sense of rubato enlivens each phrase. I have always thought of this piece as a string player's vehicle, with the piano confined to clumping along in the background. Again, not here, where Argerich consistently brings out little turns of phrase that make the piano part as interesting as the viola line . . . This is great music-making by any standard, with pianist Martha Argerich at her best, traversing a wide repertoire with some friends who also happen to be among the greatest artists at work today. The Beethoven Trio makes for a dramatic start, dynamics varying from explosive to ethereal within the first minute . . . violinist Julian Rachlin and cellist Mischa Maisky aid and abet with relish . . . violist Bashmet is superb throughout . . . [in Bartók's First Violin Sonata] Argerich and Renaud Capucon are magnificently barbaric. Indefatigably, Argerich then joins Gabriela Montero for some uninhibited Lutoslawski, a stimulating climax (followed by an ingenious encore) to what must have been an unforgettable evening. Argerich, Rachlin and Maisky tear into Beethoven's "Ghost" Trio for the sort of performance you'd revisit again and again. Renaud Capucon abandons his usual sweetness of tone for something altogether more abrasive in Bartok's First Violin Sonata . . . And there's the added treat of a rare solo outing for the lady herself in Schumann's "Kinderszenen", played with her characteristic improvisatory élan. There are so many good things to hear here, all given the extra frisson of live performance, that it's hard to pick a favourite, although mention must be made of Lutostawski's "Paganini" Variations, with Gabriela Montero on first piano.
. . . [a] night to remember . . . Right from the aggressive opening of Beethoven's "Ghost" Trio op 70 no 1, Argerich is in full control, driving violinist Julian Rachlin and cellist Mischa Maisky into a near frenzy. Luckily their supreme musicianship brings style and elegance to the trio, and the slow movement is intense and moving . . . it is the tracks with Lang Lang, where they perform Schubert and Ravel that are truly memorable. Judging by the booklet photo Argerich let Lang Lang have the primo part, but her rhythmic intensity in the Ravel is truly magnificent . . . The last "encore" track with Gabriela Montero makes you want to jump off your chair and stamp your feet! There is not a performance here without interest. Several are absorbing. Renaud Capucon and Argerich present the Bartók First Sonata in a serious manner, played with great virtuosity, which I find riveting . . . [it found the pianist at her finest and I can do no more than give Capucon's] playing and this performance the highest endorsement . . . [Bashmet and Argerich] play the Schubert with virtuosity and charm . . . Lang Lang joins Argerich in the first half of the program to play Schubert's "Grand Rondeau", which again is offered in a performance of great charm and good humor . . . Equally enjoyable is Lutoslawski's "Paganini Variations", with the dynamic Gabriela Montero . . . [Beethoven / Piano Trio no. 5]: the entire first movement has an energy (and the third movement a "brio") which I find quite exhilarating. The second movement lacks nothing in repose and reflection and is most moving . . . [Argerich follows the Beethoven with] a notable traversal of "Kinderszenen" . . . Argerich adds an energy and even at one or two points a toughness which show us new insights. Can one ask more of a performance? This is one to which I will be listening until the end of my days . . . in toto, what a concert! . . . Let us hope there are many more such appearances. She has been, arguably, the greatest pianist of the last half-century. This lovely DG release is a good reminder of her quality.
. . . ["Carte Blanche"] was a concert like no other. Beethoven's "Ghost Trio" gets an unforgettable performance: stunning in its electrifying vitality, in the eerie, pianissimo ghastliness (yes) of the slow movement, and in the masterful discourse of the finale -- all replete with some of the most fabulous piano playing you'll ever hear . . . the Schubert "Arpeggione" Sonata and Bartók Violin Sonata No. 1 are superb in all respects. And what a thrill to hear Argerich's buoyant, shapely, truly basic bass; no less, her exquisitely subtle and varied melodic inflection in every part. On this evidence alone she is the most comprehensively versatile and instrumentally resourceful chamber pianist currently playing. The concert from Verbier from 27 July 2007 will endure as a classic moment on all counts . . . [Argerich's] rendition of the Schumann preserves its precious intimacy, touched by her sense of rubato and dramatic poise. For fleetness of fingers, her "Hasche-Mann" serves as a demonstration and a challenge . . . By the suite's end, we feel Schumann, having "spoken" his infinite nostalgia, has found a true votary in Argerich . . . [Beethoven / "Ghost Trio"]: a beautifully balanced performance, a combination of visceral excitement and tonal delicacy . . . Between the weaving chromatic harmonies and the use of "tremolando", the musicians capture the unearthly effect impressively . . . I found the Yuri Bashmet realization, on viola, of Schubert's 1824 "Arpeggione Sonata" with Argerich thoroughly convincing . . . the arrangement perfectly suits both Bashmet's instrument and musical temper . . . Argerich adds her own colorations and inflections of the harmony to produce a rendition that lingers long after the Allegretto last movement has passed away . . . [Lutoslawski's "Paganini Variations"] proceeds with a secure panache that makes this performance a classic. Montero than applies her solo apparatus to a tango arrangement of "Happy Birthday" . . . its contrapuntal possibilities emerge in a jazzy, bluesy, rendition that would have had Gershwin and Ellington in thrall. We are. For me, violist Yuri Bashmet's eloquent and gorgeously sculpted interpretation of Schubert's Arpeggione Sonata represents this concert's high point. The Allegretto in particular adds up to a master class in how to make phrases speak as well as sing, how to gently recede when assuming an accompanying role, and how to imbue pizzicato passages with the utmost in tonal variety. Notice also in the sublime slow movement how subtly he shifts his color and timbre on long, sustained single notes in reaction to the piano part's changing harmonies. This is something from which all aspiring singers can learn. Egal in welcher Besetzung, die argentinische Pianistin war das Herz des Konzertes. In allen Werken des mehr als zweistündigen Abends konnte man sie hören, gemeinsam mit dem damals 25-jährigen Lang Lang etwa in Schuberts "Grand Rondeau" und Ravels "Ma Mère l¿Oye". Jugend und Altersweisheit inspirierten sich dabei gegenseitig zu einer wunderbar atmosphärischen, musikalisch erfüllten Interpretation. Wahrscheinlich nicht alles, aber doch viel von der Live-Atmosphäre dieses Konzertes überträgt sich durchaus auf die CD. Beethovens "Geister-Trio" spielte Argerich gemeinsam mit Julian Rachlin und Mischa Maisky geheimnisvoll verschattet im langsamen Mittelsatz, drängend und erfüllt von glühender Intensität, Leidenschaft und Spannung in den schnellen Ecksätzen, eine Deutung, die ungemein geschlossen und gleichzeitig sehr spontan wirkt, so, als sei sie aus dem Moment heraus entstanden. Möglich ist das wahrscheinlich nur bei Künstlern, die sich derart seismographisch und mit nachtwandlerischer Sicherheit verstehen . . . [Schumanns "Kinderszenen" spielte Argerich] voller Innigkeit und Poesie, zugleich schnörkellos, unprätentiös und stringent . . . Insgesamt: ein Fest der Kammermusik. aber selten realisiert wird. Martha Argerich solistisch, duettierend, sich friedlich duellierend -- das ist, kurzum, allen Ernstes prächtig unterhaltend. Argerich und Yuri Bashmet liefern gefühlvoll Schuberts Arpeggione-Sonate, Argerich und Rénaud Capucon feurig Bartóks erste Violinsonate. Argerich nimmt die "Kinderszenen" Schumanns beiläufig elegant, so zauberisch empfunden hört man die Träumerei nicht alle Tage. Als Trapezakt bewältigen Gabriela Montero und Argerich Lutoslawskis Paganini-Variationen für zwei Klaviere. Und Montero serviert sprühend eine "Happy-Birthday"-Improvisation als Zugabe. Eine CD, vor der auch zu warnen ist: Ihr Niveau schärft die Maßstäbe derart, dass sie allergisch macht gegen den halb- und uninspirierten Mainstream. Cet album fait revivre cette soirée avec bonheur . . . la pianiste argentine est présente durant les deux heures de concert et nous offre un solo, ce qu'elle donne rarement, dans les "Kinderszenen" de Schumann. Ces dernières enchantent, jouées avec toute l'exigence et la maturité que demande paradoxalement cette musique . . . [Beethoven / Piano Trio no. 5]: une interprétation qui justifie à elle seule l'acquisition du disque. Le premier mouvement est saisissant, haletant (au sens propre du terme, quand on entend le souffle des interprètes! ), le fameux "Largo" fantomatique et le "Presto" joué avec grâce, dans un tempo très rapide, mais tout à fait maîtrisé . . . le clou de la deuxième partie est la Sonate pour violon no. 1 de Bartók. Grâce à Renaud Capucon et sa partenaire, la sonate devient véritablement "propice aux rêves et aux visions", pour reprendre le mot de John Cage . . . Enfin, les "Variations pour deux pianos sur un thème de Paganini" du compositeur polonais Lutoslawski sont interprétées brillamment, avec la pianiste vénézuélienne Gabriela Montero. Cette dernière termine le concert sur un "Joyeux anniversaire", dont l'improvisation virtuose met le public en joie. MISCHA & LILY MAISKY ¡España!